Once more Betal was narrating another story. A king took his son to a sage and said, "take him as your student but make sure that he is treated like a prince." The sage said, "If I am to teach him, he will be treated as any other student." This made the king angry. He resolved to teach the sage a lesson. When the prince completed his education, he asked his teacher. "Sir, what gurudakshina (fees) should I give you?" The sage replied ,"I will ask for my fees when the time comes." When the prince returned, the king asked his men to burn down the sage's ashram. The prince got very angry when he saw the burnt ashram. He said, " I will kill the person who has done this." Hearing this, the sage asked him for his fees. Betal asked Vikram, "What did he ask for?" 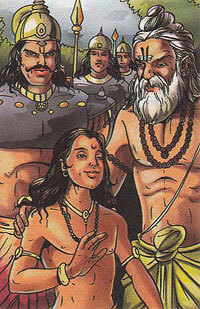 Vikram said, "The sage asked the prince to forgive the king." Betal said, "You are right, but you opened your mouth, so here I go."